Old Villages That Disappeared - - In the 1970's Jim Landing wrote some wonderful articles for the News Dispatch concerning many of the "Lost and Vanishing" County Villages. Tribute to James E. Landing Ph. D.
James E. Landing Ph. D. was born in Buffalo New York on January 7, 1928, the son of Benjamin and Margaret (Crohen) Landing. Landing graduated from Manchester College in 1952. He served in the Navy in World War II and continued to serve in the Pacific after the end of the war. He began his teaching career in the Michigan City School system 1952 until 1967 when he commenced being a Professor at the University of Illinois. He continued there until the spring of 2007. Landing received his Ph. D. in 1967 at Penn State University. Dr. Landing has four surviving children who reside in the Michigan City area. County Villages. We would like to take this opportunity to remember Dr. Landing and thank his family for the work he left for us to enjoy for years to come. When the county was established in 1832, there were villages and hamlets dotting the landscape. A few survived but other remain only as a vague memory. We break these down into categories. 1. Indian villages that were here during the early pioneers days. 2. Rural villages had their day when they were along well travel routes. And example would be Door Village on the old Sauk Trail. Many of these prospered for a period of time but then disappeared and no longer exist. 3. Commercial villages, who were established by proprietors who sold lots. A prime example of this would be Michigan City. 4. Villages come into existence from the Railroad. The railroads were good and bad for the smaller villages. Those lucky enough to have a rail station in their village faired much better than those on old foot trails or wagon routes. So what were some of the Villages that came and then all but vanished? Alida Station in Clinton Township became a junction for several different railroads in 1876. Edgar M Botchkiss was the first station master and also served as the village postmaster. Alida never really grew, only having about 5 houses located there at one time. 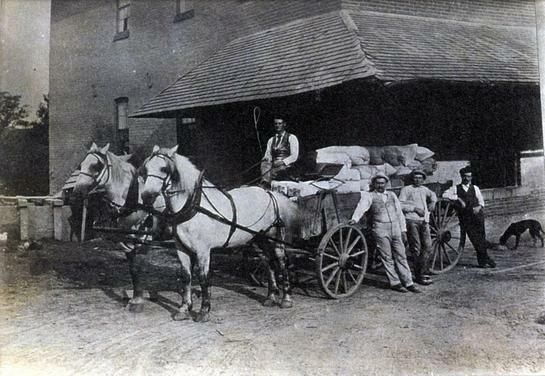 But it was considered a fairly important grain and stock shipping center. Only in existence from a few years, it soon all but disappeared and now can only be reached on foot. Correction from the work of Jim Landing - Alida Station can be reached by two dirt roads to reach this old rail town area. Andry Station served the residents of Springfield Township. If you hunted for it today, you would look just east of County Road 300W at where the old South Shore Railroad had its junction. Bailly was a dream that never quite materialized. Joseph Bailly was a French fur Trader. He wanted to establish a French Canadian village at the mouth of Trail Creek. He filed a village plat, using all French names for street names, in the village of LaPorte the same year the county was formed. Bailly left the Indiana Calumet area in 1835 and along with him, his dream of his village. Ballywood -platted in 1929 and included the peninsular area of land jutting between North and South Pine lakes in Center township. Beattyville - Was founded in April 1853 when James Whittem platted 13 lots in a triangular road junction which served southern Coolspring Township. Only 1 lot sold. At one time you would find a Blacksmith and Wagon shop along with a hotel in this small village. Eventually the entire town was purchased by George Selkirk, a resident of Michigan City. The name Beatty had come with John Beatty one of the earliest settlers in that area. Traces of Beattyville are located at 100N and East of Hwy 421. Today this area is known as Beatty's Corners. contacted Landing to tell him the school location. Bee Grove was a rail station on the Pittsburgh, Fort Wayne and Chicago (Penn Central). It was located in section 11 of Hanna Township along the rail line and near US 30; intersecting with county road 1400S. It was a small sandy island located in the Kankakee marshlands. Belmont (Bellmont) was on of the earliest villages which was platted in 1836 by Ward Blake and Abraham Charles. The village consisted of 187 lots. It too was passed up by the railroads and now is but prairie land at the County Roads of 900S and 400W. Bigelow - AKA Bigelow Mills - Abijah Bigelow (the only known Veteran of the American Revolutionary was buried within Michigan City limits started a mill in 1835 in the Clinton Twp. area just south of the prairie lands along Hog Creek (now known as Crooked Creek or Topper Ditch). This area contained 3 important ingredients: - water from the creek, wood for adjacent timber lands and transportation, that being the road connecting the Sauk Trail with Lafayette and the Wabash County. Bigelow filed for a plat for a village in 1837. The village consisted of 144 lots divided in 20 blocks. Three major streets were: Liberty, Papineau and Niger. In the same year he constructed a grist mill which was adjacent to a raceway. This village contained a blacksmith shop, a cabinet shop, a gunsmith, a harness shop and several dry goods stores. In 1838 the village became a designated post office with John Closser appointed as postmaster. Closser later purchased Bigelow's grist mill. A true village never really developed and in 1848 the village plat was vacated. Bigelow's family left the area. Bone Island - was located in section 12 of Hanna Twp. It was near the point where Whitman Ditch enters the Kankakee River. The name was derived from the many remains of the bones of small animals hunted and trapped by the Pottawatomie Indians. At this time it was a part of Starke County and by 1861, when Hanna Twp was formed, the Indians were long gone. With drainage of the Kankakee Marshes, Bone Island became a memory. Bootjack is a familiar term to those from the Rolling Prairie area, but the village which was located along the Sauk Trail has long disappeared. At one time a cluster of homes in the vicinity of a trading center was established in 1835 by an Indian known as Rice. When the Michigan Road was surveyed, many of these little communities became absorbed back into the land as the Sauk Trail was no longer heavily used. The Railroads too would by-pass Bootjack and nearby residents would settle in nearby Portland (later to be known as Rolling Prairie). Byron - was another of the early villages that grew along the Sauk Trail. Its origins in the settlement of William Hunt who, in 1832, built a cabin on the prairies of central Kankakee Twp. Soon there was a store, a church, a village hall and a school. Byron became the post office for the area with Stephen G. Hunt as the first postmaster and along with Hiram Orum was convinced the site was propitious for development of a future metropolis and, in 1837, the filed a plat for the village of Byron in the northeast quarter of the southern part of the eastern half of section 15 in Kankakee Twp. The village was to be divided into 160 lots with the main road called Chicago Street. Michigan, Buffalo and Erie Streets would intersect in a northeast-southwest angle. Chicago Street coincided with the Michigan Road since the village lay at the junction of that road and the Sauk Trail. a hotel opened in 1847 and flourished until 1857. Also Warehouses and granaries prospered in the area. By 1849 it was necessary for Elias Howe to make a slight addition to the village. But this prosperity was short lived. The westbound railroads bypassed Byron in favor of a location nearly 1 1/2 miles to the north, where a depot was built. 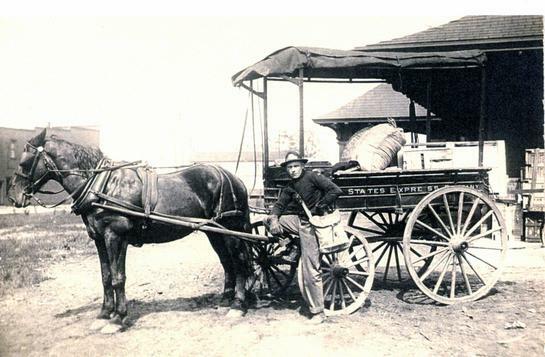 The post office was moved to Portland (Rolling Prairie) in 1853. By 1874 on four home and a schoolhouse remained at Byron. The early Byron is no more. Callao (Callloa, Callas) village that was associated with the railroad era. W. A. Taylor constructed a grain warehouse along the Pittsburgh, Fort Wayne and Chicago Railroad (Penn Central) in section 2 of Cass Twp. Soon a Methodist Church was established along with a blacksmith shop and a hotel all operating within this small community. Even a local physician was available. In April of 1860 Taylor, filed a plot for 27 lots on the south side of the rail line. But the rail officials had their own ideas and in 1861 they built a depot a half-mile to the west and named it Morgan. Most of the residents moved westward to be closer to the depot. Taylor too moved his home to Morgan and this left Callao with a very short lived existence. Camp Colfax was a small subdivision and consisted of only 17 plots in Center township. This small group was later annexed to the city of LaPorte. This little burg was the area between Second and Fifth Streets and is known as Colfax Avenue. Cathcart's Grove: a pioneer settlement along the Sauk Trail about 2 1/2 miles east of present Westville. Approximate location is thought to have been at the junction of Joliet and Wozniak Roads. The Grove was named in honor of Hon. Charles W. Cathcart who owned about 3 sections of land in New Durham Twp. at the time of his death. Cathcart worked in the land offices in Washington and headed west and into Indiana in 1831. The Grove became a hub for local commerce in 1835 when Leonard Woods, a storekeeper from the village of New Durham, which had just been founded, settled there and opened a store. Mr. Woods would later move to Michigan City and Cathcart's Grove became simply another section of timber and farmland in LaPorte County. Chambers' Landing: named for Andrew Chambers who settled in what is now Hanna Twp. in 1837. He operated a ferry across the Kankakee marshes. There is no access to the site today, it was believed to have been located in section 5 just west of what is now known as Long Ditch. Clinton: - This was a cluster of early farmers centered around section 10 in Clinton Twp. near Hog Creek, close to what is known today as the present junction of County Roads 900W and 800S, the Methodists built their first log cabin chapel there. But it was neither a village, trading center or a town. It was just a local name for a community. Condonville: was a trading center and established in 1894 by Thomas Condon, appointed to serve as postmaster on the depot on the Lake Shore Rail Road (Penn Central) . This place consisted of a store, tavern and little else. It was located at the junction of County roads 700W and 100S. Corymbo: was one of two villages to have been plotted in Springfield Twp, the other being Springville. Location was along the Michigan Central Railroad. Plat was filed in August of 1873 by Craigie Sharp Jr., who had extensive land holdings in the area. There were 104 lots with Main Street running along the southern margin of the rails. Corymbo was in a well wooded area and served as a fueling station for the engines on the railroad and at one point became an important lumber shipping point. This endeavor was short lived and today you would have to look along US 12 between County roads 600W and 1000N in section 18 of Springfield Twp. Cushman Acres was a subdivision platted by the Michigan City Trust and Savings Bank in April 1927. It was laid out on the Davis property East of Michigan City and consisted of approximately 170 acres lying North of Michigan Blvd., south of Warnke Road and east of Menke Road. Only 46 lots were actually platted and the area was later annexed to Michigan City. Dillon - was a small crossroads village in Lincoln Twp, developed as a result of the building of the Wabash Railroad (as known in that time frame) in the late 1880's. The Dillon station was developed about a quarter a mile east of the rail junction. There were about 1/2 dozen houses built in the area and traces of this village formation can be seen on the east side of County Road 675E just south of the railroad crossing in section 31 of Lincoln Twp. Dormain - an early settlement site near an Indian village in Nobel Twp. near the present Union Mills. Durham was a switching stop for the Penn Central west of LaPorte and east of the junction of County roads 700W and 400S. At this point the sidetracks which handled box cars to be shunted into LaPorte were dropped off by the through trunk lines. It was never really a village but took its name from its location in New Durham Twp and the location of New Durham village (Pinhook). Eastport - was a village platted in June of 1859 by Jesse Bond. It consisted of 30 lots in the northwest portion of section 36 of Center Twp. The area would later become annexed to the city of LaPorte and is now to be found bounded by North Street, Maple Avenue Rumely Street (Lake Street in the original plat), and Bond Street (Pond Street in original plat). Eddyville - was a Subdivision platted in May, 1905 by Arthur Eddy and his wife Abbie. The area was in the southwest quarter of the north half of section 4 Coolspring Twp adjacent to the city limits of Michigan City. For today's measurements it was in the vicinity of S Franklin Street and where Barker Jr. High School was at. It was annexed into the city. Flood's Grove - this was a short lived hamlet situated in New Durham Twp., and formed largely as a rival to the village of New Durham. Known in the 1840's with a large general store operated by John Armstrong and a blacksmith shop run by Henry Herrold offered New Durham considerable competition. Name calling became common practice between the two villages, the New Durhamites referring to Flood's Grove as "Squatham" and the Flood's Grovers calling New Durham "Pin Hook". Flood's Grove, as best can be determined, was just south of New Durham at the junction of what is now county roads 350S and Wozniak. The name was derived from property of James Flood what at one time had been a tailor in New Durham. Both communities declined with the arrival of the railroad in the 1850's. Gleason Station - located in Section 18 of Coolspring Twp. Hail Columbia - was a village in Center Twp. plated in December of 1859, and immediately annexed to the city of LaPorte. Located five blocks south of the County Courthouse, the plat consisted of 9 parcels of land presently bounded by Indiana Avenue, Michigan Avenue, Alexander and Osborn Streets. The entire village consisted of one city block. Hatch's Mill - takes its name from J. B. Hatch, a native New Yorker who moved to LaPorte in 1852 and bought a 57 acre farm in section 29 of Galena Township in 1855. He established himself as one of the foremost sawmill and threshing men of the area and the post office serving the area was moved to his farm after the hamlet of Hesston declined. In the early part of the last century there was a store, post office and a town hall which had an upper story used for lodgings. This was short-lived and Galena remains one of the more isolated sections of the county. The location of Hatch's Mill would have been found at what was known as the Koster property along 900N in 1971. However the sawmill was located where the small tributary of the Galene River crosses County Road 200E just north of the old Galena School site. Hesston aka Hesston Corners is a well known name for longtime county residents. Today there is a store and tavern on this corner. The name is derived from P. M. Hess, another native New Yorker who settled in Galena Twp in 1856. He operated a store for three years and also ran a sawmill along the Galena River. For a brief period Hesston was the area post office and was one of the nodal rural hubs of that section of Galena. Schoolhouses were built just to the east and west of Hesston (Mud Creek to the west of Goit to the east) and a local church. Hess became a prosperous farmer in the area and once owned over 100 acres. Even before the arrival of P. M. Hess, the corner had already become a focal point. One of the early settlers, Matthew Mayes, arrived in 1833, aided in the building of a saw mill then, the following year, bought his own farm and opened a blacksmith shop. The corner that would later become known as Hesston was known at this time as Mayes' Corner. The was a heavily lumbered area and was well known for the manufacture of barrels, wagon wheels and various other forms of woodwork. Hesston can still be found, simply visit the intersection of County Roads 1000N and 200E. Just West of Hesston on 1000N you can find the Hesston Steam show. Hillsdale - was a railroad stop on the South Shore Railroad in section 26 of Galena Township. It was located about halfway between the Smith Station and the stop at Hudson Lake. Its location today is at the junction of the railroad and County Road 425 E.
Holmesville - was a railroad village in New Durham Township and was platted in 1855 by Hiram Holmes. Legal description states it was 22 lots in the southeast corner of section 4 of New Durham Twp. just south of the Lake Shore and Michigan Southern Railroad (Penn Central). The small village was just one block in a north-south direction, but was intersected by three streets, High, Walnut and Beech. The village was associated with the coming of the railroad but had been occupied previously. A sawmill had been erected there in 1833 by Jacob Bryant and another one at a later date by Henry Larray. Bryant built the first home which was later occupied by John Moorman. A post office was establish in 1852 with a Mr. Prosser as the postmaster. Holmesville also had a grocery store and a tavern. Most noted citizen of Holmesville was Samuel S. Davis, born in New York State in 1825. The family moved to Indiana in 1835 and Mr. Davis was primarily a merchant in his early years. Once settled in the Holmesville area he became a successful farmer and acquired of 200 acres and also served as the area postmaster. Holmesville, even with the rail depot and a post office did not prosper as much as Otis, two miles to the West. Holmesville was never more than a small cluster of homes and stores. There are few traces of Holmesville today which is on the east side of Holmesville Road just south of its intersection with Snyder Road. Holmesville remains only a memory. Hoyville Station - A railroad stop on the New York, Chicago and St. Louis Railroad and situated in section 29 of Prairie Twp. Although in the 1890's it looked like an ideal spot for a village in the area where the Kankakee marshes were being drained, but no village ever developed and it soon vanished. Area old timers remember the area for the Nickel Plate railroad going through. Hudson- a number of communities bearing the name Hudson in them have been established at one time or another. In Hudson Township, Hudson Lake (known in the old days as La du Chemin) the largest inland water body in the county. Settlement of Hudson Lake was first officially founded as the village of Lakeport in June of 1834 by John Egbert. Although it was settled much earlier and used by the French, British and many Indians. Similar to the area east of Westville it was the earliest of the focal settlement points in the county. For a short time Lakeport, soon after known only as Hudson was a rival of all other settlements in the county and had a post office as early as 1834. The village was laid out on the east edge of the lake with the business district arranged around a powerful steam mill erected by Garrett Bias. But 1835 there were two taverns catering to the daily coach trace and the village was one of the major marketing center for farm goods in the area. In 1837 the town almost died during the panic, not only because of the financial crisis but also because local residents had been caught up in the speculative fever of a proposed canal that was to be dug from Toledo to New Buffalo and was to pass through Hudson Lake. Because of the speculation and rumor, the lots became too costly, therefore settlers chose elsewhere to plant their roots. Even many of the villages prominent citizens left and the village was doomed to remain a small rural hamlet. The present Hudson Lake came to be because of a number of subdivisions which now surround the Lake. The first of these was Hudson Lake Villa and it was platted in 1926 with 259 lots plotted. In May, 1927, Henry Holling filed a plat for Hudson Heights with 83 lots on the southern edge of Hudson Lake and in October of that year George M Illges founded Hudson Lake Beach on the northeastern margin of the Lake. Hudson Meadows was platted by Mary Danielson and Eli Enos 92 lots were laid out in 1950 east of Hudson near county line. All of these subdivisions combined today are known as residents of Hudson Lake. Independence - had two locations noted in LaPorte County. The first was a village in the eastern portion of Wills township which is now known as Sauktown. It was settled before 1833 and a village platted in 1837 and was situated in section # 28 which was at the site of the first common school in Wills Twp. In this location was a store, cabinet shop, a boot and shoe shop, a wagon shop and a tailor shop. Shortly after a gristmill was built by the Galbreath family but was discontinued when the water dried up. Another mill was built and run until 1851 but it was moved north to Puddletown. Since then nothing remained at Independence or Sauktown, except the public schools. The old cemetery in the area still exists and is known as Sauktown cemetery but the church bearing the same name is no longer there. The other Independence was a most irregularly shaped piece of land platted next to the Cummins addition next to the city of LaPorte in 1859. It included 20 parcels of property, including the residence of Gen. Jasper Packard, one of the county's early an most respected citizens. Jacob Wile, Joseph Guggenhime, Mary McCoy, William Walton, J. A. Caldwell and Thomas Gleason were some of the other property owners. Independence is now a part of LaPorte and lies about one mile south of the courthouse bounded somewhat irregularly by Warwick, Michigan, Monroe and Wiley streets. Indian Point was located in the extreme southeastern section of Noble Twp. along Mill Creek (once known as Markham's Creek) where the Pottawatomie Indians had a trail which entered into the swamps of the Kankakee marshes. It was occupied by the Indians until their forced removal from Northern Indiana in 1837. ISH-KWAN-DEM - was a semi-permanent Pottawatomie Indian village located along the Sauk Trail just west of what is now Westville. The village disappeared soon after the first settlers began arriving in the county. Joprice was a small village platted in June 1897, by William E. and Fidelia M. Pinney. It was a railroad town, located on the west side of the Louisville, New Albany and Chicago Railroad (Monon) at the intersection of sections 8 & 17 in Cass Twp. The original village called for the layout of 12 lots. Although the name of Joprice has long disappeared from the maps of LaPorte County, the village remains today in its same location known as South Wanatah. La Croix, like Joprice was the former name of a village that still exists, Otis. Platted in April of 1870, by Salmon Tucker to consist of 26 lots in section 5 of New Durham Twp. Distinctly a railroad village, it lay at the intersection of the Lake Shore and Michigan Southern (Penn Central) and New Albany, Louisville and Chicago railroads. Before the present name of Otis was adopted in 1872, there was some name confusion. The village was first known as Salem Crossing, and the first post office was established with that name. The Louisville, New Albany and Chicago railroad, however, preferred the French name, and it was filed in the courthouse by Tucker under this name. Confusion and considerable controversy continued and Tucker suggested the name be change to Packard to honor Gen. Jasper Packard of LaPorte who was serving in Congress. A short time later, Gen. Packard suggested the name be changed to Otis; a suggestion that was honored. Thus, Salem Crossing, La Croix and Packard disappeared from the map of La Porte County. Lakeland - an incorporated town that lay on the east limits of Michigan City in the general vicinity of Long Beach and Pottawattomie Park. Highway 12 ran through its center and at one time there was a shopping center located south of the highway along what is not known as Karwick Road. Lakeland was officially annexed to Michigan City, but this having taken place only a few decades ago, many residents still consider is a sub-unit of the City. Lake Park was a stop on the South Shore Railroad that served residents along the southern margin of Hudson Lake. Lakeport was one of the earliest villages in the county being recorded in June 1834 by John Egbert. Original plat shows the village divided in 60 lots on the south shore of what is now known as Hudson Lake. When platted if was located in Wills township, but it became part of Hudson Township when Hudson was created in 1836. Shortly after it took on the name of Hudson and is known by that name to this day. Laketon - large village consisting of 275 lots platted in November 1857, by W. J. Walker and his wife C. M. Walker. Walker was one of the earliest residents of LaPorte and owned extensive properties, most of which were subdivided and later annexed into LaPorte City. Laketon - a political nightmare, portions lying in each of Center, Scipio, Kankakee and Pleasant townships, and covered parts of four different sections. The village was on the northern edge of what was then known as Walker Lake. The area would later be drained and would be used by a local truck farmer. Laketon was annexed into the city of LaPorte and is bounded by Rumley, Ohio, Roberts and Clement streets. The Patton Cemetery occupies land located between Laketon and the old Walker Lake. Liberty Bell Beach -- was the official name of the village that was developed along the west and southern edge of Sagunay Lake in Galena Twp. It was platted by James A and Ammea Burchin, but the official courthouse plat is undated. Magee -- was a railroad stop on the Pere Marquette and Wabash railroads in section 34 of Scipio Twp. It really never developed, but the location is on County Road 500 South at the railroad junction between Long Lane and Indiana 39. Maye's Corners -- was the name applied to the county road intersection where the village of Hesston is now located. The name comes from Matthew Mayes, who built one of the first mills of Galena Twp. The history may be viewed under the previously discussed topic of Hesston on our Towns site. M-DAH-MAIN -- was a Chippewa Indian village located near Hudson Lake where Catholic representatives from the famed Carey Mission at Niles, Michigan, established an outpost and ministered to the Indiana. It disappeared soon after 1830 as the Indiana moved westward. Morgan -- was a village platted by W. A. Taylor in May, 1859, consisting of 21 lots in section 2 of Cass Twp. It was to be a railroad village located south of the Pittsburgh, Fort Wayne and Chicago Railroad (Penn Central). The northern boundary was to be called Rail Road Street and the southern boundary Main Street. Cross streets were State, Meeker, Clark and Ohio. This was a year before Taylor platted the village of Callao just a half mile to the east. Taylor was evidently trying to have a site ready when the railroad decided to locate a depot. Callao developed first and Taylor erected a grain warehouse, and a hotel, blacksmith shop and Methodist church were also built. The village even had a resident Physician. Despite this development the railroad located its depot at Morgan and soon all of the residents drifted westward to the new site. The Post Office was also moved to Morgan and Taylor, himself had his home moved from Callao to Morgan. But Morgan's success was short-lived as it was eclipsed by the rise of Wanatah. Mt. Pleasant - refers to two rural areas, both in Galena Twp. The earliest was related to the building of Mt. Pleasant Methodist Episcopal Church in the Southeast corner of section 31, in 1844. This church has long been known as Lamb's Chapel in honor of Mr. Oren Lamb, upon whose property the church was located. Lamb's chapel also has the distinction of being just West of the highest point in the county above sea level. The second reference is to the building of an elementary school in the southern portion of Section 26, although there had been a school earlier just to the East. This area is about the one rather to the west of where St. John's church is today. In general the term Mt. Pleasant was applied to the middle of the three main ridges which form the Valparaiso ground Moraine, a rugged glacial feature which accounts for much of the scenic beauty of Galena Township. Nauvoo - was the former name of the present town of Rolling Prairie. Although the official date of filing is not available in the recorder's office, the original town was platted and filed in 1853 by: W. J. Walker, the famed land-owner and subdivider of LaPorte. The original settlement was known as Nauvoo, the plat was filed as Portland and the town soon became known as Rolling Prairie since the post office and the railroad preferred the latter name; there already being a Portland in Indiana, further East. New Durham - needs no introduction to longtime county residents. It was one of the earliest settlements in the county, and is known today as the village of Pinhook. Its location along Indiana 2 between LaPorte and Westville means that many persons continue to pass through the village. In the pioneer period the village was much better known and today is more easily recognized by the name Pinhook. Pinhook was a name given to the residents by the people of Flood's Grove, which the New Durhamites referred to as Squatham. Flood's Grove and Squatham have long disappeared from the map of LaPorte County but Pinhook survives. Niles - is somewhat of a mystery. On Feb 15, 1839, the common council of Michigan City dis annexed the northeast quarter of section 28 and stipulated that these boundaries would form the "Village of Niles." Mr. Niles was one of the earliest settlers of Michigan City, and this action might have had something to do with this request. The property involved was practically all marshland along Trail Creek North of the present sewage plant. Oak Grove - was a rural community in the southeastern section of Wills Twp. No village ever really developed, but a school of that name (section 25) existed for many years. Oakwood Center or Station - small rural hamlet - southern portion Section 5 - Springfield Twp., where Nickel Plate Railroad crosses US 35 between US 20 and LaPorte. Several homes and a store were still located there in the 1970's. Packard - was the present village of Otis for several years. It was named in honor of General Jasper Packard of LaPorte who was then serving in congress. 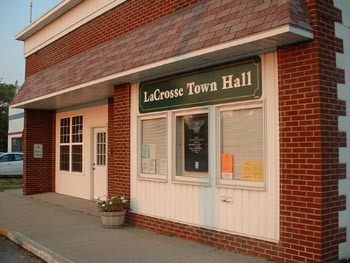 This town had previously been known as LaCroix and Salem Crossing. General Packard suggested the name Otis and Otis it became. Puddletown was one of the earlier localized place names in the county, being located in the southern portion of section 9 in Wills Twp. For many years a public school by that name served the rural students of the area. There was, at one time, a saw mill located there, and the village was along northeastern margin of what was known as Finger Lake. This area is along the southern side of Indiana 2, 3 1/2 miles east of the intersection of U.S. 20 and old Indiana 2. Quakertown was a name applied to the settlement of early Quaker families in what is now the northeastern section of the city of LaPorte. The Quaker Cemetery, still there, is one of La Porte's more famed historical landmarks since the early Quakers buried their dead most simply using field stones, most of which were unmarked gravestones. Quinn was a name applied to the eastern margin of section 13 of Union Twp. where the township borders adjacent adjacent Johnson Twp. The name was derived from E. Quinn, who owned land along the western edge of what is now County Road 600E at the junction of County Road 875S. Quoit (Grand Quoit) was an Indian meeting place and village in Eastern Wills Township, section 18. It was known by early settlers but it first achieved fame before La Porte County was formed, since the Indian village was identified in the account of the journey of Major Stephen H Long, one of the most famed of the explorers. Long's party passed through the village in June, 1825. Quoit was utilized by the Indians until 1834. Rome was a dream which never came true. It was platted and filed September 23, 1836 by William Teall, David Sprague, Dolon, Johnson and B. C. Bradley, all early settlers. The description called for 91 lots in section 32 of Hudson twp., along the Michigan Road. The description was optimistic enough for the day, but they also wanted the lots laid out in the shape of a star. Nothing came of the venture and the location today in the west side of County Road, 800E, just north of US Highway 20. Riverside - is not only a mystery, but an enigma. Applied to Section 5 of Dewey Twp., which is without rivers, the name origin and the settlement remains unknown. Correction from the work of Jim Landing is a small settlement along the Kankakee River at the point where highway US 421 crosses the river. Round Grove - was the name by which county residents frequently referred to the property of Jacob R. Hall, who settled in La Porte County in 1833 east of Door Village. At one time he had aided in the construction of the Michigan Road, later turning to farming acquiring nearly 600 acres of the finest land on Door Prairie in Scipio Twp, His famed home illustrated in the 1874 Atlas of La Porte County, was built in 1850. The home and his famous brick barn were located at the junctions of what are now County roads 200S & 200W. Rozelle still exists, but few county residents might know of it. The village was founded and recorded by Joseph Unruh, who filed in January, 1859. The description called for 29 lots which were to be aligned along the railroad (Monon) on the west and the public road (now US 421) on the east in Section 8 of Cass Twp. This location is about one quarter mile north of the present village of Wanatah. Salem Crossing - was one of the early names for village of Otis. Sauktown is the present name of the early village of Independence, already described. Shaha-walla Beach was a village founded and platted by Mr. Harry B. Tuthill of Michigan City on Feb 22, 1894. It called for 94 lots in sections 15 and 22 of Michigan Twp along the shore of Lake Michigan. This area is now contained within the Town limits of Long Beach. Mr. Tuthill resided at 718 Wabash Ave and was a long time judge of the Superior Court,, serving as a Republican. Smith Station - was a stop on the South Shore Railroad to serve the residents of Galena Twp. who lived east of the large Springville Marsh. The station is at the junction of the railroad and county Road 200E. Spry's Island is located in the western section of Hudson Lake in Hudson Twp., in sections 29 & 30. The name comes from George M Spry, an early resident, who first described it , although the name never really became popular. Squatham was a term of derision given to the residents of Flood's Grove by the villagers of New Durham in the very early history of the county. see for more on this topic. Stitesville - referred to the area in northern Springfield Twp and owned by many members of the Stites family. Located now on route 39 just south of the Michigan state line. At one time the old Stite's school was converted to a convalescent home. one time there was not only the prison farm orchard but a grocery store, a filling station and several small houses. All are gone now. Thomaston (Thomaston Station) was a railroad stop along the Chesapeake and Ohio Railroad in section 19 of Hanna Township where the rails intersected with those of the New York, Chicago and St. Louis. At one time there was a grain elevator at Thomaston but the small center never did become a successful village. The specific origin of the name is unknown, but the area was known as being surrounded by the Rosenbaum families. Tracy was a railroad village along the Baltimore and Ohio in Union Twp. Specifically it was located at the junction of sections 7, 8, 17 and 18 along County Road 100E just north of the railroad. It was a flourishing village at one time, having a school, a Lutheran church, a Methodist church, a store and a number of homes. Tracy did not grow during World War II primarily because of the development of Kingsford Heights just one mile to the west. Sometimes local residents in the area refer to the newer homes as constituting New Tracy. The old Tracy Cemetery is still in existence on the east side of County Road 100E about one-half mile south of the railroad tracks. Waverly - Center Twp - refers to the section just northwest of the city of LaPorte between South Pine Lake and Stone Lake. Waverly Road runs through the area and local residents refer to the lake front area as Waverly Beach. It was a stop on the interurban line between Michigan City and La Porte in the early part of the 20 century. The area has been annexed officially to the city of La Porte. West Hamilton - was a very early settlement in section 21 of Kankakee Twp. along what is now highway Indiana 2 about one mile southwest of Byron. The name is credited to W. P Hunt, C. W. Brown and N. P. Nichols, all early settlers about 1832 who had come from the village of Hamilton in St. Joseph County to the east. At that time, this was the route of the Sauk Trail and it was a busy thoroughfare, but Byron became the major village of the area until the coming of the railroad. Wilder's Station - is located along County Road 235S where the Monon crossed the Erie Railroad just west of highway US 421. There are still a number of homes in the area and the old Wilder's School was a rummage store when this article was written in 1971. The village is in section 32 of Dewey Twp. just one mile north of the Kankakee River. Wilhelm - is a name that has been used in reference to LaPorte County, but exact location is unknown. Willvale - refers to a small settlement at what is now the junction of County roads 300W and 1800S in Prairie Twp. The name comes from the Wills families after whom Wills Township was named. At one time there was a public school located just south of the road junction but today is all farm country. Woodside - is a plat consisting of 50 lots in section 35 of New Durham Township along County Road 775W just north of highway US 6. The plat was filed in September, 1942 buy Leonard and Susie Smith and consists of approximately 11 acres. It is one mile south and two miles east of Westville.